Ellerbrock-Norris Agency, Inc. was founded in 1906 by a dentist who could not buy insurance coverage. Brian Bassett became the agency’s current president in 1996, and the agency now has four satellite locations in Hastings (primary office), Lincoln, Kearney and Omaha, NE. Ellerbrock-Norris is a multi-line agency that represents a multitude of companies and employs over 40 people. "We strongly encourage all staff members to achieve some sort of industry designation, such as CPCU," says Brian Bassett. "With our 111 year-old business culture, we continually focus on strengthening the business acumen through our staff and the education process. The more we know about the business, the better we can serve our clients." From a growth standpoint, the agency is very conscious of maintaining their deep-rooted culture by focusing on their employees but also by applying their industry knowledge to their client’s advantage. Their holistic approach "may be slower, but it’s much more controllable." "We developed a risk management process called ENCORE, which stands for Ellerbrock-Norris Comprehensive Ongoing Risk Evaluation," says Brian. "Using this program, we aim to exceed the client’s expectations through a holistic risk platform, which has been tremendously successful for us. We want to be the most important part of their financial wherewithal." As a returning 2018 Pinnacle Agency, we partner with Ellerbrock-Norris because we share similar core values that are also focused on top-notch service to the client. "We’ve been fortunate to have partnered with Ellerbrock-Norris for the past 18 years" says Shane Martinez, our Omaha Branch Manager. "It has been a pleasure to work with one of the premier independent agencies in Central and Eastern Nebraska. Brian’s leadership fosters an environment of innovation while attracting young talent into the agency and the industry." Our Omaha Branch is based out of Omaha, where Ellerbrock-Norris also has a satellite office. It’s important that our business goals align with our agency partners, and it’s rewarding to know through hard work and leadership we can continue to be successful together. "Columbia is a great company, and Shane has been a tremendous asset," says Brian. "He’s a good leader, and I’m honored to work closely with him. John Butler, our Territory Manager, is great to work with too!" While it’s important for us to remain closely connected to our agency partners, it’s arguably more important for our agency partners to remain closely connected to the communities in which they work. "We try to be involved in everything our clients are involved in, and that includes being very community-minded," says Brian. 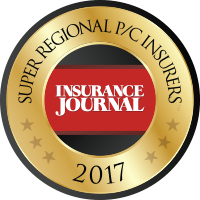 "When we keep our client’s needs in sight, we can be more competitive in the insurance climate, which makes for a better client experience with us."